"It details the events that led up to the great radio boycott of 1941 and how that event impacted the development of American popular music for the rest of the century. It dives into the history of the 1909 Copyright Act and the resulting Herbert v Shanley Co. Supreme Court case. It also makes clear what the differences between ASCAP and BMI are". If I had a pound (even a Euro) for every time I have told students the story of the French composer (Ernest Bourget) arguing with the patron of the café concert Ambassadeurs over his bill (as opposed to his public performance fees) and the consequent founding of collective management organisation SACEM, I wouldn’t need to work. It was fun to learn that ASCAP’s foundation was similarly triggered by a row in a bar. What is it with songwriters and composers? Spending inordinate amounts of time in bars seems to be a sine qua non for creation. Sidebar: In the mid-1990s, the USA came full circle in this respect – restaurants and bars got their own back with the passing of the US act exempting certain shops, bars and restaurants from paying public performance fees. There are similarities. Bourget’s music was being performed at the Paris Opera Comique when the row erupted over the bill. In parallel, , shortly after the founding of ASCAP, the American composer, Victor Herbert challenged the use of his song “Sweetheart” in the fashionable Times Square restaurant Shanleys (where Herbert was dining with Puccini). Composers should thank famed jurist Oliver Wendell Holmes who delivered the majority opinion (he did not recuse himself , which maybe, as his father made a living from copyright, he should have done). The right to be paid for public performance of a copyright work, was set, in circumstances where those supplying the music did so for profit – a condition that became a key plank in challenges to ASCAP’s desire for fees. 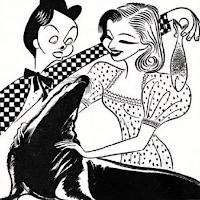 The podcast coverage of the 1909 Copyright Act is brief but Sharkey, a performing seal, takes centre stage in the story. The rise of radio in the US led to case after case being brought by ASCAP, as stations sought to demonstrate they were not using music “for profit”. They also argued they were not broadcasting “music” but that “particles of the air” were being stimulated! They argued they were a “public service” and that they were helping citizens ease their “pain” by distracting them. Fortunately, we have yet to see a variation of those arguments coming from today’s streaming services. ASCAP won in lower courts and the US Supreme Court supported the lower court’s decision. Licence fees were negotiated and, reluctantly, paid by the radio stations. As the profits from radio grew, so ASCAP got bolder and at the end of the 1930s sought to double their radio licence fees. The broadcasters looked for a way to challenge what they saw as an abuse of ASCAP’S monopoly power and found what they believed to be the society’s Achilles Heel. ASCAP membership was not open to all – the society had rules about a potential members catalogue size, value and even, whether the works were recent. Most members were white males who wrote Broadway successes or music for Hollywood. They were “skimming the cream” and there were scores (no pun intended) of US songwriters who could not collect. In 1939, at the radio industry’s annual meeting ,the broadcasters founded a new collective management organisation, Broadcast Music Inc or BMI. In what proved to be a key move for the future of music, BMI signed writers of roots music, blues, country, jazz and the aspiring writers ruled too young and unproven to belong to the ASCAP “club”. Confident in the quality of their repertoire and sure of their hold on the public’s taste, in 1940 ASCAP put the broadcasters on notice that, if they refused the increased licence fee, they would not be permitted to broadcast the ASCAP catalogue past the end of the year. One radio station in Montana brought felony extortion charges against the President of ASCAP, and he was arrested and jailed in Arizona – though the charges were not pursued. As the year and the argument dragged on, fewer and fewer ASCAP songs were being broadcast and by December 1940 radio bandleaders were instructed to stop playing music in the ASCAP catalogue. At midnight on December 31st 1940 the ASCAP licences expired. To the astonishment of ASCAP the public were not as upset as ASCAP expected, the new music captured the public’s heart and revenues from the ASCAP songs plummeted . This was a row that, with a PhD in hindsight, by briefly changing the landscape of American music being broadcast, may have fundamentally influenced the country’s public taste and the longer term strength and popularity of the genres added to the BMI repertoire. Maybe even the birth of rock and roll with this change in America’s “collective musical ear”. An animal trainer, who had lost all but two of his performing seals in a devastating fire, opened a nightclub in Kingston, New York state. But by the time of the radio boycott he was determined to re-establish himself in the work he loved and built a large seal training facility – a Seal College. The scout for talented “pupils” began and Sharkey was discovered. He was an intelligent pinniped, was trained and learned to play a homemade instrument. Guided by a conductor, Sharkey pressed levers to create the musical notes and “Where the River Shannon Flows” became his standout performance. It was an ASCAP tune. On a national tour in 1941 Sharkey was booked to perform on a radio station in New Orleans. On March 5th, with the boycott still in place, the station contacted the ASCAP lawyers asking for an exception. They refused and the press, instead of the crowd, went wild. The public outcry that had failed to materialise with the boycott now kicked in over Sharkey the seal and his heartless Louisiana legal ban. The radio boycott endured for 10 months and by November 1st 1941 a new ASCAP national radio rate was agreed, nearly identical to that which had applied before the radios went silent on ASCAP’s repertoire. But it was 1949 before Sharkey was completely exonerated. Sharkey finally got his chance to perform on the networked Ed Sullivan Show, juggling, playing Frisbee and…..performing “Where the River Shannon Flows”. The podcast goes on to explore the flawed membership policies of both societies in a fast changing music landscape. It highlights the link between broadcasters, record labels and the BMI repertoire and ASCAP’S misguided attempts to clip BMI’s wings on anti-trust and collusion grounds. BMI embraced African Americans as members but the integration was limited – publishers would be signed up but often it was left to the publishers’ discretion about whether the songwriters were sharing revenues. ASCAP was slow to recognise the “new” music until the 1960s when new leadership led to a change in policy that ultimately meant that ASCAP and BMI became equivalent – so-called “parity products” – save for the Board composition at the two societies. You can listen to the podcast yourself by following this link. Thank you so much to you, Matthew and Amanda. This is a wonderful telling of the history of ASCAP, BMI, and the music collective copyright movement in the USA. Of course, nowadays Sharkey the Seal might benefit from performers’ rights under the WPPT – though not yet on broadcast radio or TV in the USA where “terrestrial broadcasters” are exempted from paying for the public performance right for sound recordings and performers. Much more attention should be paid to the irony that you note of the restaurant industry getting its members exempted in many cases from having to pay for performing rights, the notorious "Section 110" dispute in the WTO, and how the USA has been a scofflaw for more than a decade in terms of compliance the WTO ruling. Once again, according to the USA, it's "Do as we say, not as we do" when it comes to international respect for copyright. This “podcast” is a “must listen” for anyone not familiar with this important story than spans a century of American copyright history and illustrates many recurring themes and controversies that are still far from settled. Wiill the Poke be the test parody piggie? Breaking point: is a copy of a parody infringing?